Thirty-one Lincolnshire pupils were taken to hospital after suffering breathing problems on a school bus. They were treated for suspected carbon monoxide poisoining after being taken off the bus, police said. All the pupils, from Birkbeck School, in North Somercotes, near Louth, were later discharged from hospital. The coach operator, Stagecoach, said the incident could have been caused by water leaking onto an exhaust pipe, causing steam to pass into the vehicle. The pupils - aged between 12 and 16 - had arrived at school on Monday morning complaining of nausea and headaches. The school's head teacher Gary Loveridge said: "It appears that for a significant part of the journey the main body of the bus had obvious fumes in it, according to the children." He added he initially phoned the Accident and Emergency Unit at Louth County Hospital and was advised to call the ambulance service. All the youngsters' parents had been informed, he said, and he expected the vast majority of the pupils involved to be back in school on Tuesday. 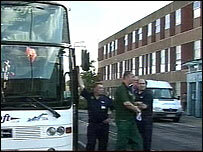 Eight of the affected youngsters were taken by ambulance to the Diana Princess of Wales Hospital in Grimsby, with the rest travelling by coach. "The injuries that I've been made aware of were only minor so I should imagine it was shortness of breath, possibly watering of the eyes and some blockage of the nasal passages," said Phil Morris, from the East Midlands Ambulance Service. Police officers are working with the coach company to investigate the circumstances of the incident. Lincolnshire County Council said it had been informed by Stagecoach that the vehicle concerned had now been traced. Denise Carr, head of transport services for the council, said: "The vehicle that took the children to school has been withdrawn from service. "A full and thorough investigation will take place into the incident."